I love old Christmas movies. You know the ones, they have that essence of a simpler time when the holiday season was all about family and food, singing Christmas carols around a fire, and, of course, decorating. They always showed live Christmas trees adorned with silver and gold, red and green. Not only were the halls decked, but the men and women were as well, dressed in their fancy clothing, ready for a family get together. 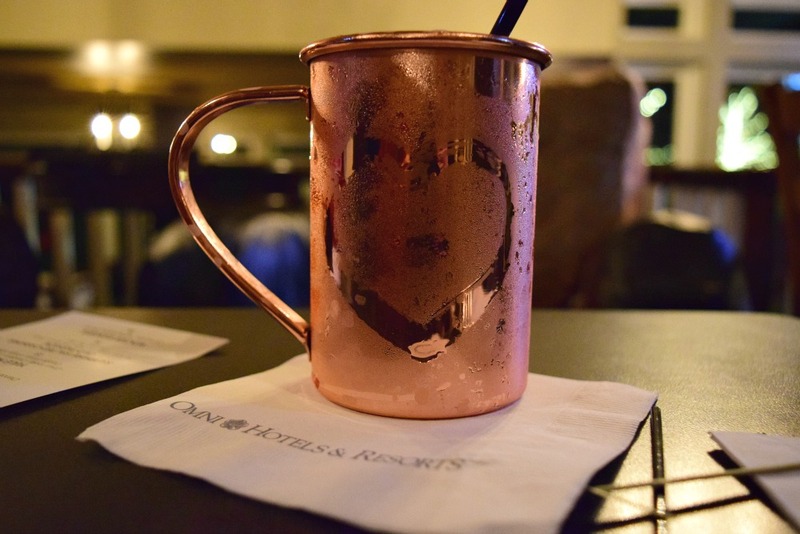 When my family and I walked into the lobby of Omni Bedford Springs Resort this December, it was as if all of those old fashioned movies came to life. Not only is the resort filled with rich history every day, but the resort truly goes all out when it comes to the winter holidays. 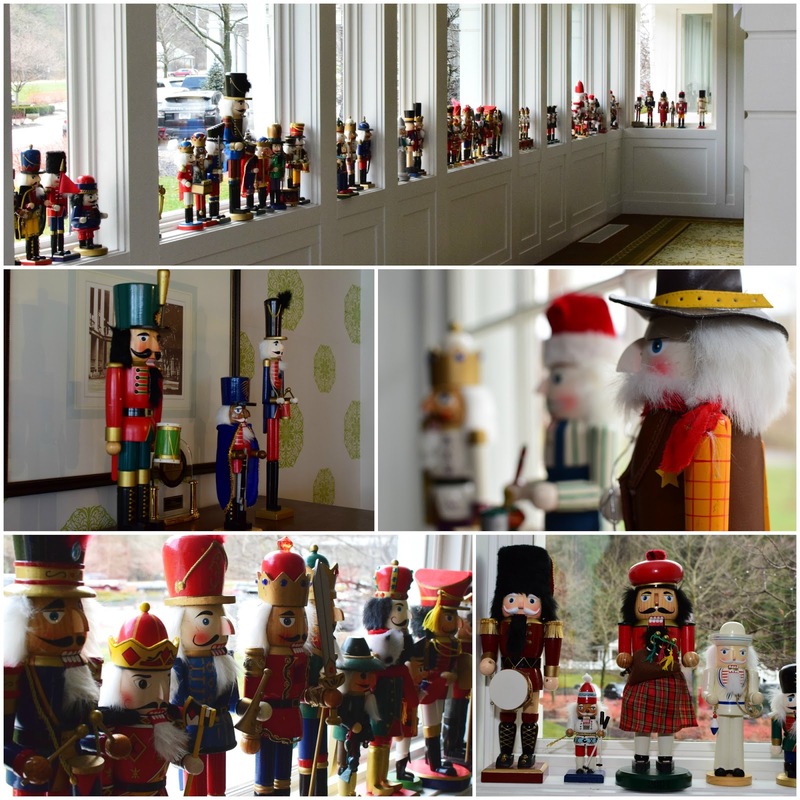 They place well over 500 nutcrackers throughout the lobby and common areas, have beautifully-decorated Christmas trees, and even have a Yule Log placed for guests to write their names and a sentiment. For two days I felt like I was in a Christmas movie and for that I thank Omni Bedford Springs Resort. What made this holiday season at the resort extra special for my family? Here’s the highlights. 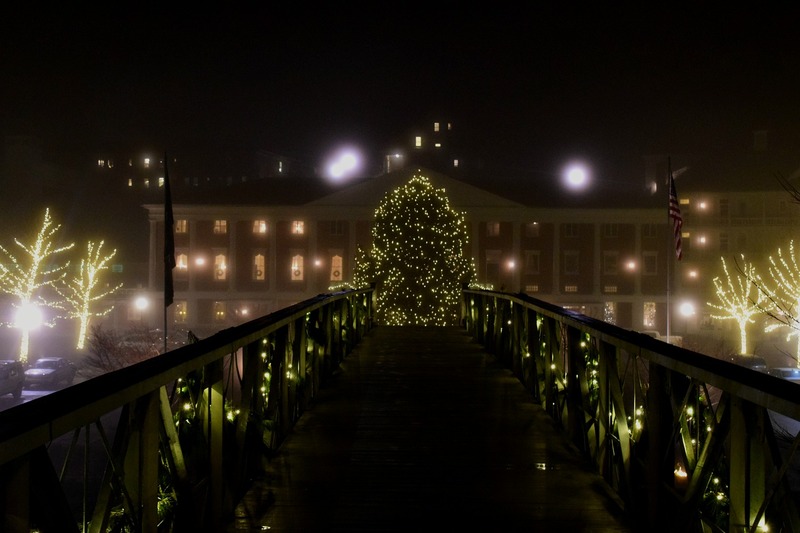 One special night in November, Omni Bedford Springs Resort really goes all out with its Grand Illumination. this year on November 29th, the festivities kicked off with the lighting of its 40-feet tall holiday tree, performances by the Allegheny Ballet, sleigh rides, and even an appearance by Santa himself. Since the 1700’s nutcrackers have been used for that daunting task of trying to break open the shells of nuts. As the years passed, the handy task helper became whimsical and conversation pieces were the norm in homes. Ever wonder why a nutcracker bares its teeth? According to folklore, it’s to keep evil spirits at bay and to guard family members in the house that it resides. The 500+ (depending on who you ask, it’s now closer to 600) nutcrackers at the resort deck the halls, tables, and window sills during the holidays. They are every shape and size, color and theme and are from the collection of Pennsylvania resident Gary Bartik who owns around 1,000 of them. We spent hours leisurely walking the halls and checking them out and it even became a game for us to try to find them all. Walk towards the front desk in the Grand Lobby and you can’t help but notice the giant Blue Spruce Christmas tree. Once we closed our mouths from the mouth-gaping beauty, we started a hunt for other beautifully-decorated trees in the common areas. Dating back to medieval times, the story of the Yule log begins in Scandinavia. First a Nordic tradition, it was an entire tree and the largest end would be placed in the fire with the rest of it sticking out into the room. The Log was burnt a little bit for 12 nights (yep, that’s where the Christmas carol comes from!) and any leftover bit would be saved for the next year and used to light that year’s log. The Omni Bedford Springs Resort Yule Log helps to kick off the Grand Illumination Celebration and guests can sign their name on it for good luck in the coming year. 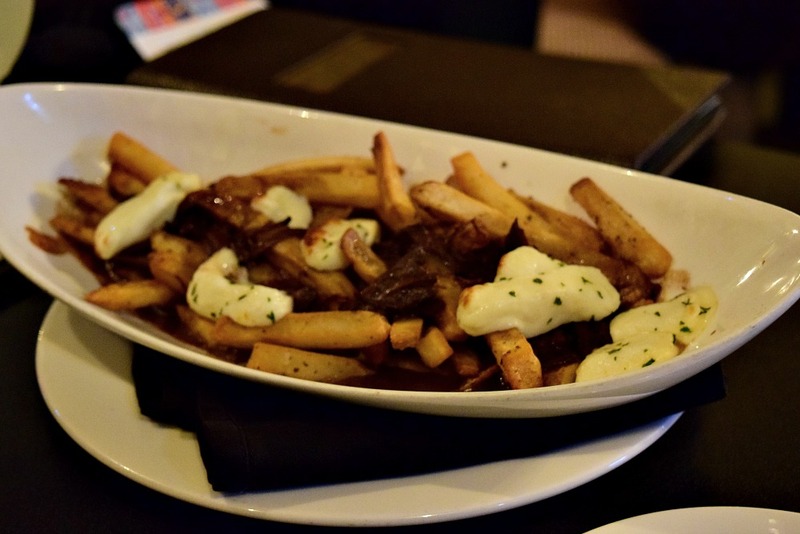 With restaurants like 1796, Frontier Tavern, and The Crystal Room, we have had the pleasure of trying them all. This trip we headed to Frontier Tavern and with delicious menu offerings and a seasonal beverage list we were all set for a fun night. I’m a sucker for copper mugs and couldn’t help but snap a pic of his Yule Mule. With a spin on the traditional drink, the resort’s holiday version has citrus vodka, cranberry juice, lime, orange bitters, and ginger beer. Mr. Locke is a new fan! 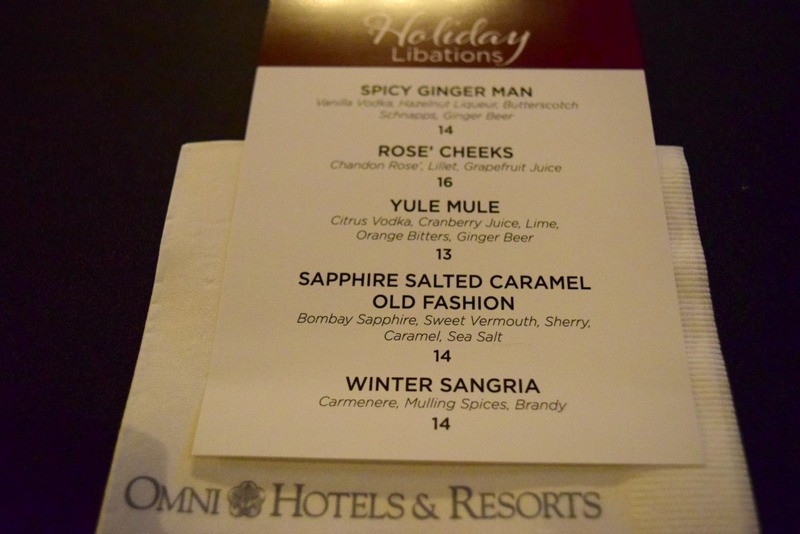 We chose from a fun holiday drink menu including Winter Sangria, and a spicy Ginger Man. After a starter of Braised Beef Poutine, we had to go for locally and regionally-sourced dinners like the Tavern Burger (from Sauderton, PA), and The Kid’s favorite, a Veggie burger. Okay, okay, technically not a traditional holiday meal, but the resort prides itself in its ability to create delicious, current dishes with an Omni Bedford Springs twist. With unseasonably warm weather, we headed out to the fire pit after dinner and, with a box of s’mores ingredients, made some ooey, gooey dessert and new friends. S’mores kits can be purchased at Frontier Tavern and there’s about enough ingredients for 8-10 s’mores. As is tradition at Omni Bedford Springs Resort, every afternoon from 4-5pm Tea Time is offered for guests. It’s a way to stop what you’re doing, cozy up next to one of the fireplace sin the lobby, and simply relax. With each visit to the resort, we look forward to tea time. If you want an extra-special tea experience during the holidays, the resort offers a Nutcracker Tea. With petit fours, scones, tea sandwiches, and specially-blended tea, the experience is one that every tea lover should try at least once. As for breakfast, a visit to The Crystal Room and its breakfast buffet was our way to start the day well fed. Filled with locally and regionally sourced breakfast items including fresh sausage, eggs,French Toast and maple syrup, fresh fruit and breads, and even a made to order omelette option we were full until lunch time. No mid-morning hungries for us! Once a sacred herb associated with vitality and fertility, the reason as to why mistletoe is considered a holiday tradition is still up for debate. 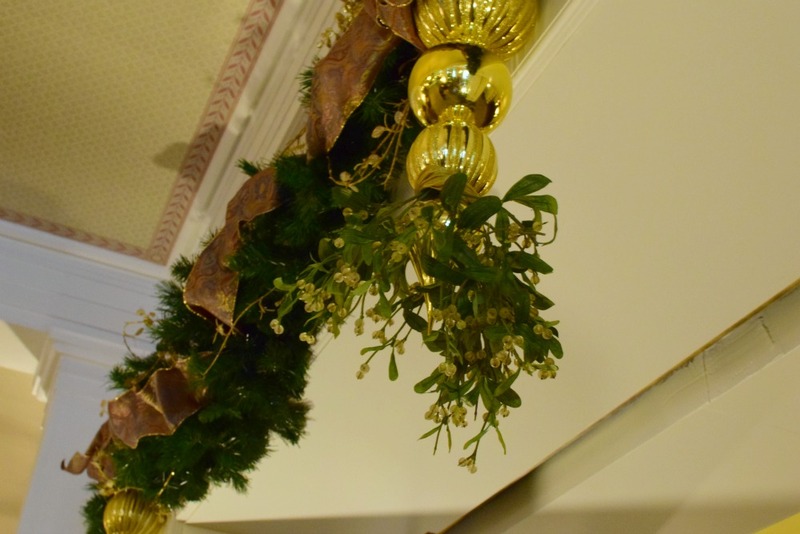 Beginning with the 18th Century, men would steal a kiss from women standing under it and refusal would be considered bad luck.Omni Bedford Springs Resort has mistletoe in the lobby area and I love the historic touch. Did Mr. Locke and I kiss under the mistletoe? 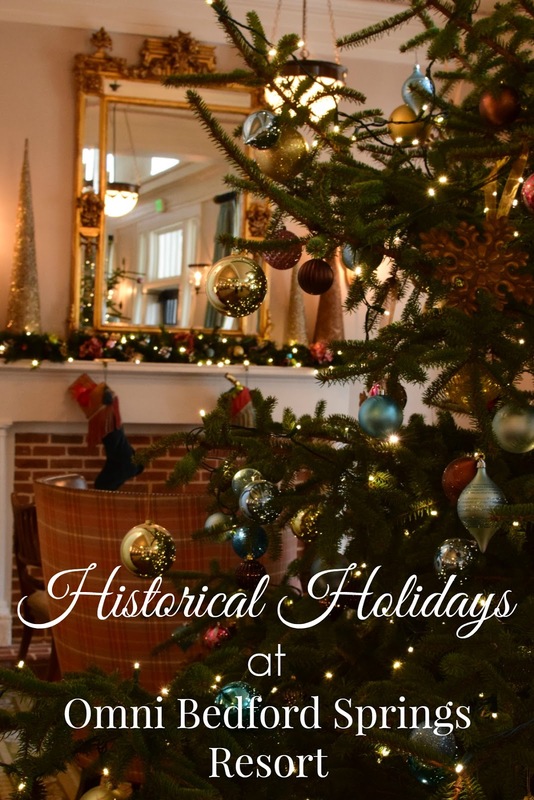 Every chance I got!Visiting Omni Bedford Springs Resort during any time of the year will immerse you in its rich history, but there’s something magical about celebrating the holidays there. Even thought it’s filled with modern amenities, the feel and ambiance during our visit made me want to start wearing bustles, white lace gloves, and fancy hats. Oh yes, they’ve got quite a collection of hats to view, too. Need a Reason to Head to First Night Pittsburgh? Here’s 5 Awesome Ones! Thanks for your comment. You're absolutely right, I didn't mention the natural springs on property at Omni Bedford Springs for one reason in this article-the springs are natural springs, not hot springs. They are lovely to check out any time of year, but I could not imagine testing the waters in winter. If you're interested in the history of Omni Bedford (including the natural springs) please check out my other blog post about the rich history of the property.